Is AusLottos a Scam or Legit? Read Reviews! It’s hard not to smile when you see the logo at AusLottos.com. How do you not love a little kangaroo? AusLottos.com is an online lottery provider that offers tickets and syndicates for most of the international lotteries we know and love. Well, that’s what it looks like they do. Getting into the terms and conditions, we lost the smile. AusLottos offers 14 games to play including the usual US Powerball and EuroMillions. You don’t get to find out what a single ticket costs until you click on the “Add +1” button or log in. Players can choose multiple games for 4, 8, 16 and 52 draws. There doesn’t appear to be any discounts for this. Click on the “View” button and it lists the actual tickets. It says nothing about receiving scanned copies. If you aren’t sure what to play you can buy into a bunch of lotteries through “bundling”. All Lotto Bundle includes eight lotteries for a minimum purchase of 2 weeks up to 4 weeks. The Top 4 Lotto Bundle includes US Powerball, Mega Millions, EuroMillions and EuroJackpot. 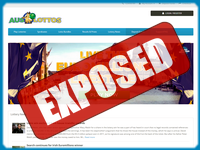 Euro Lotto Bundle has 5 European lotteries. The tickets are quick picks. AusLottos.com has five syndicates to choose from. Euro Lotto Syndicate 150 includes 100 EuroMillions tickets and 50 EuroJackpot tickets per week with 135 shares. Euro Combi Syndicate 177 includes EuroJackpot (45 tickets) and EuroMillions (132) split with 88 shares. US Lotto Syndicate 200 includes 100 US Powerball & 100 Mega Millions with 135 shares. US Combi Syndicate 82 includes US Powerball (52) and Mega Millions (30) with a share pool of 93. And last but definitely not least is the VIP World Syndicate 534 includes EuroMillions (132 tickets), EuroJackpot (45 tickets), US Powerball (52 tickets), Mega Millions (30 tickets), German Lotto (20 tickets), and SuperEnalotto (255 tickets) with a share pool of 133. Players can opt in for 1, 2, 4, 16 and 52 weeks. Once you opt-in, you can’t opt out until the active tickets draws have occurred. Winnings are paid directly into your “players wallet”. Well, except if it is a large amount and then there are security steps to take. There is no information on what a large amount is or how long it takes. All withdrawals from your player wallet are paid into a bank account. There is no other way to get your winnings. AusLottos.com says they use an insurer to “underwrite” any potential winnings. Okay, if they actually purchase the tickets, why would they need this? Usually this is only done for lottery providers where people are betting on lotteries and they are not actually buying the tickets. Firstly, you have to be 18 years or older. Secondly, you can’t live in Afghanistan, China, Cuba, Hong Kong, Israel, Myanmar, North Korea, Singapore, Turkey or the US. Oh, and not “a person prohibited by the Office of Foreign Assets Control of the US Department for the Treasury….”. Okay, that’s just weird. Now this one was weird. There is an area where there should be an address and phone number, but this hasn’t been completed. There is an online form. AusLottos is operated by a company out of Tortola (and there is an address) and regulated by the Government of Curaçao. Would you mind rating AusLottos.com? There is nothing here that says these guys aren’t legit, but there just seems something off about the site. Definitely the lack of contact details is enough to say to us, don’t play here. This site gets a thumbs down if for no other reason then there is no simple way to contact them. The team also had some mega problems (versus mega lotteries) on AusLottos.com’s T&C. At first I got all excited about this site. Then I read about the lack of contact details. Seriously! Why bother? I’m certainly not going to give my personal contact and credit card details to someone that I can’t contact – or know who they are. Forget it!